What Is A Comfort Rating? A comfort rating is a temperature or temperature range for which a particular piece of insulated clothing, boot or glove would protect you. 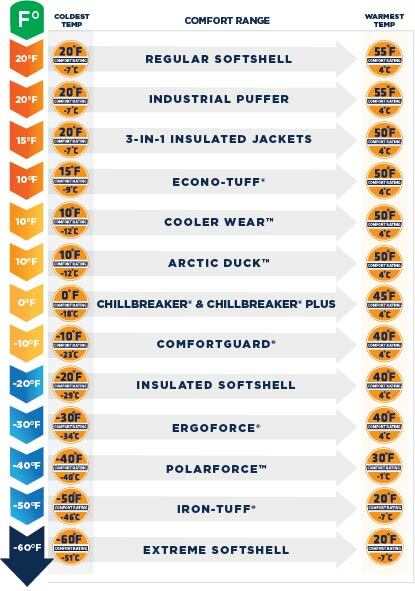 Comfort ratings on insulated clothes range from -60°F to 20°F, footwear ranges from -100°F to 15°F and gloves range from -30°F to 10°F. Comfort ratings give you a starting point when determining what insulated clothes, boots and gloves would be ideal for your situation. RefrigiWear products stretch across many temperature zones so these comfort ratings can guide you in the right direction. In fact we have a range of -60°F (Extreme Softshell) to 0°F to 30°F (Softshell, Fleece). When you need insulated clothing, start with the comfort rating. How Are Comfort Ratings Determined? We have many ways to determine what the comfort rating should be on a specific product from scientific testing to firsthand experience. Our product lines and insulation packages are temperature tested in a research facility but we also have over 60 years of experience and knowledge in manufacturing insulated clothing. In fact, nationwide team visits customers using refrigerated environments everyday to gain firsthand experience with what workers and consumers face in the cold. We combine our scientific testing, on-the-ground experience and years of knowledge to determine comfort ratings so we can help customers determine the best products for their situation. Comfort ratings serve as a guideline, but there are other factors that can affect whether that garment will be too warm or not warm enough for you. One of the biggest factors is your activity level. You may need something with a warmer comfort rating if you are sedentary versus someone who is actively moving around. For example, if you are in a 0°F environment you may need something that is rated to -20°F if you are not actively moving around. Another aspect that can affect comfort ratings is a person’s physical condition such as metabolism, weight, circulatory issues, heath problems, and age. Keep this in mind, when looking at comfort ratings for insulated clothes, you may need something rated higher than your cold environment if you tend to stay colder than others in other situations. Other things to remember are the duration you will be in the cold temperatures, how acclimated you are to working in that environment, and what other products you are wearing. Another factor to consider when selecting a comfort rating is the other elements impacting the environment, such as wetness and wind. For example, the temperature in a refrigerated warehouse may remain constant while temperatures in alpine conditions may change considerably based on wind and precipitation. In these latter conditions, the comfort rating of your insulated clothing may need to be warmer than just the air temperature. You will also want to consider the windproof and waterproof properties of clothing you wear in colder weather and working environments. It is possible to be too warm. If you start sweating or are wearing something that doesn’t allow your body to breathe, then that sweat will cause more damage, such as hypothermia. A simple way to prevent yourself from getting too warm is to wear layers. Comfort ratings can help you build a layering system and see what would work well together. You may realize that you don’t need a -50°F jacket and bibs so try something less warm like a -20°F selection or maybe you just need an insulated sweatshirt and bibs. If you work in different temperatures throughout the day layering can be key. Instead of a jacket with non-insulated pants, wear a vest and sweatshirt. Don’t forget about base layers, which can be added underneath most products. When it comes to gloves, explore liners that can go inside heavier gloves for when you go into a freezer or colder temperature. Mitts can be worn with a liner as well, and can be warmer than gloves. Boots can be worn without socks but if you are wearing socks make sure they are not cotton. You want acrylic, polyester or a wool blend. Headwear is available in a wide variety including masks, hats, caps and gaiters to make sure you get the protection you need. Every situation is different and it can be difficult to categorize based on job title, for example – if you work on a dock or are a driver, temperatures in Arizona vary greatly from temperatures in Maine during the winter. This is why we use comfort ratings, to help you find a starting point. RefrigiWear is available to help you make the best decision for your situation. Reach out to your Sales Representative or call Customer Service to get advice on what would work best for you.